I named these my French Doilies because I used a pattern I found on a French language internet site. Figuring out the spiral center was the fun part; I also liked the little 5 petal flowers. Again since this is a small doily, I made two. It is a really easy and quick to make pattern. It has one of those interesting edgings where you work back and forth covering the chains to get the top loops around the outside edge. Not much else to say except that I used size 30 DMC Cebelia thread and a size 11/12 hook. Well I guess I can let you all in on a little secret. I made a mistake on one that I didn’t see until after it was finished. I taught myself how to invisibly repair such a mistake, by cutting out the mistake and re-crocheting the area. It isn’t as hard as it sounds. It just requires a bit of concentration and a light touch since the bottoms of the stitches are free to twist out of shape. Each repair of this type has it’s unique challenges. In the long run what I learned by forcing my mind and fingers around such challenges gave me a better understanding of the art of crochet. It also reminds me to check my work more often, so I don’t have to repair it in the first place. 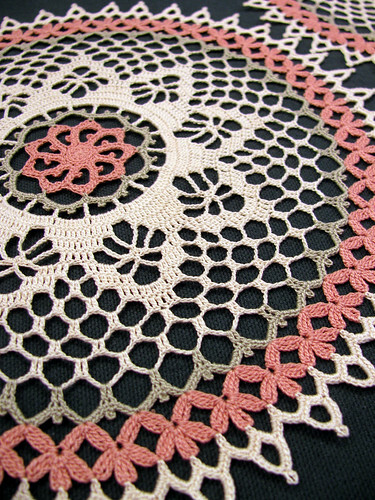 This entry was posted on Saturday, November 22nd, 2008 at 3:00 am and is filed under Crochet and Lace. Tagged: Crochet, Doily, Thread. You can feed this entry. You can leave a response, or trackback from your own site.